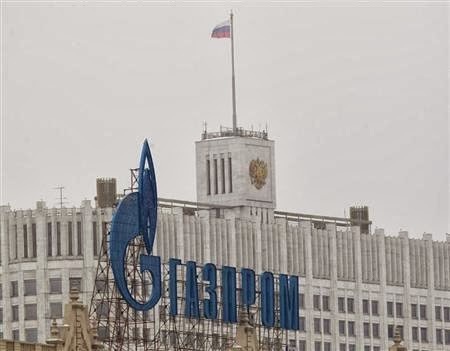 MOSCOW, Russia -- Russian gas export monopoly Gazprom demanded Ukraine pay an overdue gas bill urgently on Tuesday, raising fears of a new "gas war" and increasing pressure on Kiev as it tries to build ties with Europe. The company logo of Russian natural gas producer Gazprom is seen on an advertisement in front of the White House in Moscow. Prime Minister Dmitry Medvedev described the payment problems as critical, ahead of Kiev's signing next month of agreements with the European Union which would mark a historic shift away from former imperial master Moscow. Using language that harked back to earlier spats in which Moscow cut off gas to Ukraine, hitting onward deliveries to Europe, Medvedev told Gazprom CEO Alexei Miller Kiev had not taken the payments seriously enough in recent talks. "The (problems) exist and they are absolutely critical," he said at a government meeting. Miller said Ukraine had been given until October 1 to pay for natural gas deliveries in August, but no payment had yet been received. He said Gazprom had also paid Ukraine $1 billion up front to pump gas though its territory to Europe. "The situation with Ukraine's gas payments is coming to the boil. Ukraine has failed to pay fully for August supply," Miller told the meeting. Earlier he said he was "extremely concerned". Ukraine's state oil and gas firm, Naftogaz, declined to comment on Gazprom's remarks, but Prime Minister Mykola Azarov said the government was "monitoring the issue". "This primarily is a question concerning two companies and they have to sort things out," Azarov's press service said. Russia and Ukraine have waged two gas wars over prices in the winters of 2006 and 2009, with Moscow halting deliveries not only to Ukraine but to the rest of Europe, forcing some in the European Union to seek alternative sources of energy. President Vladimir Putin wants Ukraine to join a Moscow-led customs union and Russia has put pressure on its neighbor, which faces large payments to service its debt over the next 18 months, by tightening customs rules and banning some imports. Earlier this year, Russia hinted that gas prices which Kiev has called "exorbitant" could be cut if it joined the customs union, which unites Russia with two other former Soviet republics, Kazakhstan and Belarus. Medvedev said Russia could resort to a system of advance payments if Ukraine did not respond to its demands. "There is a danger of a new gas war with Ukraine, where the economy is struggling," said Sergei Vakhrameyev, an analyst with Ankorinvest brokerage in Moscow. "The situation of past years, when gas flows to Europe halted could be repeated again." Putin and Ukrainian President Viktor Yanukovich met in the Black Sea resort of Sochi on Sunday for bilateral talks, although neither side has commented on what was discussed. Ukraine, which imports nearly all its gas from Russia, pays about $400 per 1,000 cubic meters, slightly higher than the average price paid by European customers. Naftogaz said earlier this month it had 17 billion cubic meters of gas in storage, enough to get through the winter. Gazprom ships more than half of its gas to Europe via Ukraine. This year it aims to increase exports to Europe, where it provides a quarter of gas needs, to 152 billion cubic meters from 138 bcm last year.